With the U.S. economy in the doldrums, kids had a really tough time finding summer jobs this year. Next year, perhaps a hi-tech summer camp would be just the ticket. 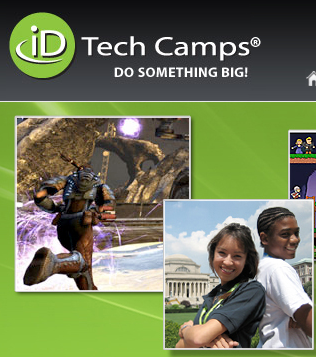 ID Tech Camps: Learn how to make iPhone and Facebook apps at the Stanford and MIT locations, as well as 3D video game design, web design, Flash, programming, robotics, and video editing at 60 university locations, like Princeton, UCLA and Harvard. There’s a week-long camp for kids 7-17 and two-week “teen academies” for kids up to age 18 on a variety of topics. ComputerCamps.com has overnight and day “Emagination” camps for ages 7 to 17 as well as a two-week”game design” program for kids ages 15 to 18. They’ve been in business since 1982. Locations include Atlanta, Boston, Chicago, New York and Philadelphia. Digital Media Academy has kids camps and teen camps. These take place at universities, including Stanford, UCLA, Harvard, University of Texas, Austin, University of Chicago and many others. They have courses in 3D game design, film making, and programming, and focus on practical work skills. National Computer Camps have been in business since 1977. They’re in Georgia, Ohio, Connecticut and New York. They have courses in web design, game design, Android apps and test preparation. The website isn’t so polished as the others, but their programs are cheaper. Giant Campus Academy has part-time and full-time game design and programming classes for grades 9 through 12.